NASA project engineer Roger Rovekamp demonstrates the X1 Robotic Exoskeleton. Astronauts could one day get a power surge from hi-tech robotic suits, like real-life versions of "Iron Man" hero Tony Stark. That's not to suggest that spaceflyers will soon become superheroes; most of Iron Man's abilities will long remain in the realm of science fiction. 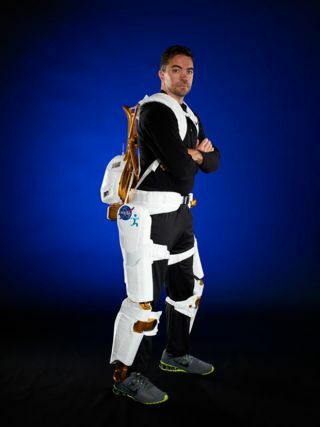 But the X1 Robotic Exoskeleton, which NASA is co-developing along with several partners, could give superhuman strength to people on long-duration space missions to an asteroid or Mars, or act as a "resistive device" for exercising, agency officials say. In the short term, astronauts could use the device to add resistive force in microgravity to improve exercising on the International Space Station, NASA officials say. X1 can record information on each session and stream the data back to Earth, where doctors can monitor an astronaut's progress. But NASA aims to send astronauts farther afield — to a near-Earth asteroid by 2025, then on to the vicinity of Mars by the mid-2030s — and X1 could really shine in deep space. The suit "could provide a robotic power boost to astronauts as they work on the surface of distant planetary bodies," NASA officials wrote in a description of the technology earlier this month. "Coupled with a spacesuit, X1 could provide additional force when needed during surface exploration, improving the ability to walk in a reduced gravity environment, providing even more bang for its small bulk." While the device has otherworldly applications, X1 could also be used closer to home, officials said. The exoskeleton shows promise as an assistive walking device, so it may eventually provide a valuable service to people who have trouble getting around here on Earth. "X1 has the potential to produce high torques to allow for assisted walking over varied terrain, as well as stair climbing," NASA officials said, adding that preliminary studies into this possible use are underway. NASA is working on the X1 in collaboration with The Florida Institute for Human and Machine Cognition (IMHC), and Oceaneering Space Systems of Houston. The technology is based on NASA's humanoid Robonaut 2, which is currently on board the space station, and IHMC's Mina exoskeleton. X1 is still under development, and it's unclear when the technology might be available for astronauts or others to use. Follow Elizabeth Howell @howellspace, or SPACE.com @Spacedotcom. We're also on Facebookand Google+. Original article on SPACE.com.